Discover the beauty of Tashkent with us! Welcome to Wyndham Tashkent – a 5-star international hotel in Uzbekistan, specially designed for travelers who look for person-oriented first class service. 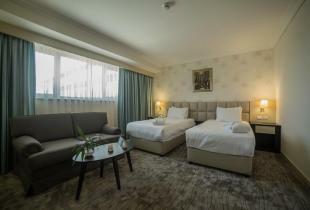 Combining style and comfort Wyndham Tashkent offers a wide range of services. All rooms and suits in our hotel are equipped with free high-speed Wi-Fi connection and flat-panel digital TVs. Moreover, all rooms are equipped with safes and minibars. 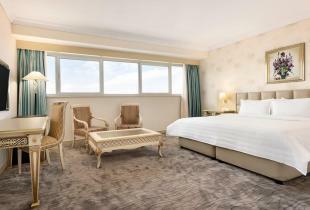 The hotel offers spacious luxury rooms and suits. 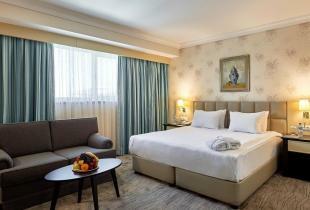 There are two bedrooms and two TVs in deluxe rooms, while a picturesque view of the center of Tashkent may be observed from rooms and suits on the upper floors. In front of you a real oriental bazaar, the Teleminor television tower, the library of Alisher Navoi. What are we going to look for?